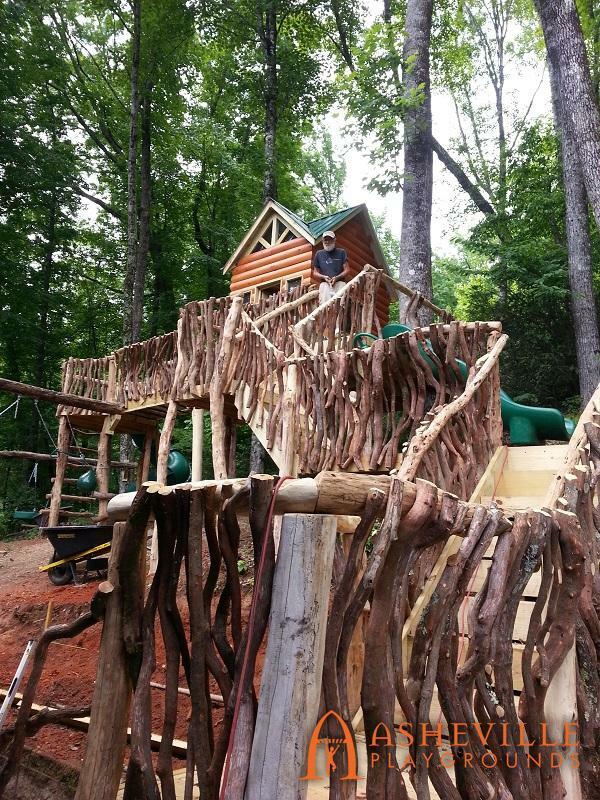 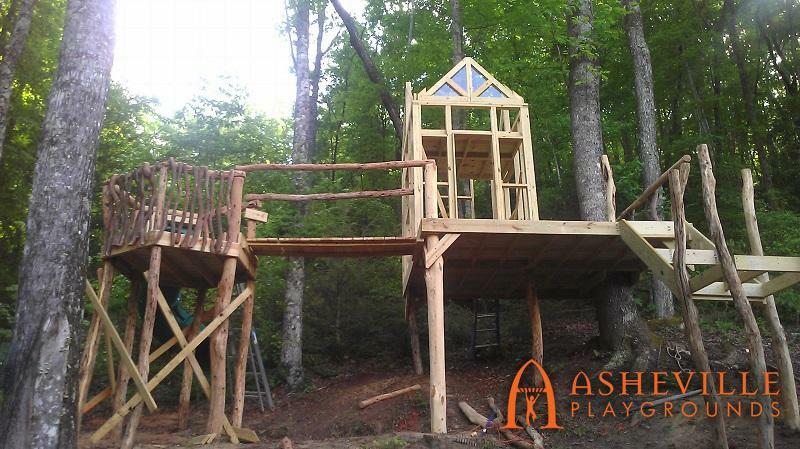 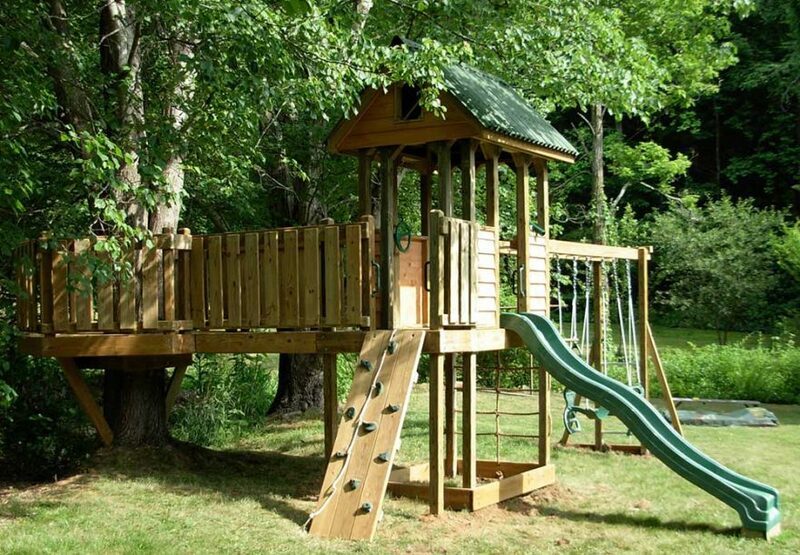 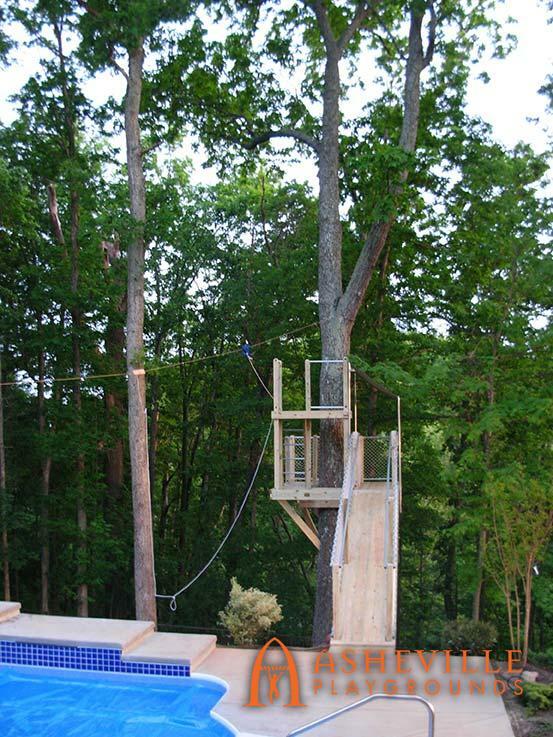 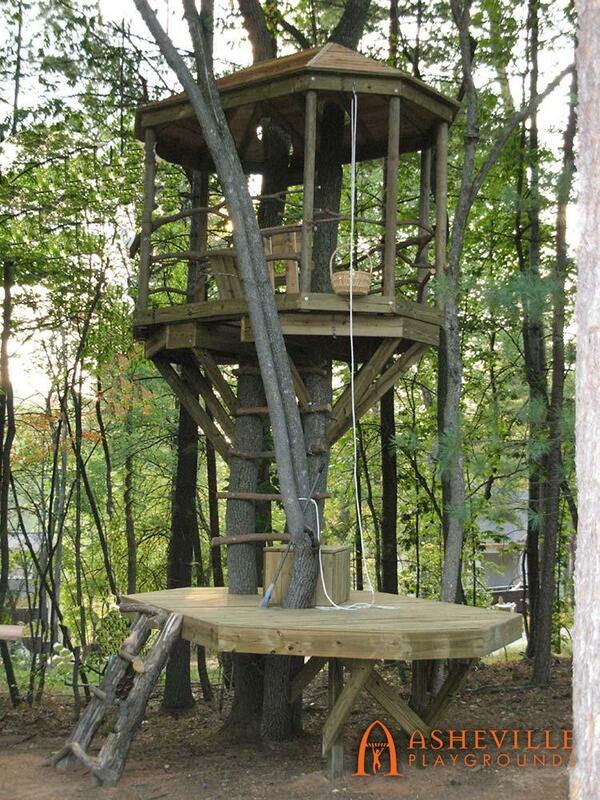 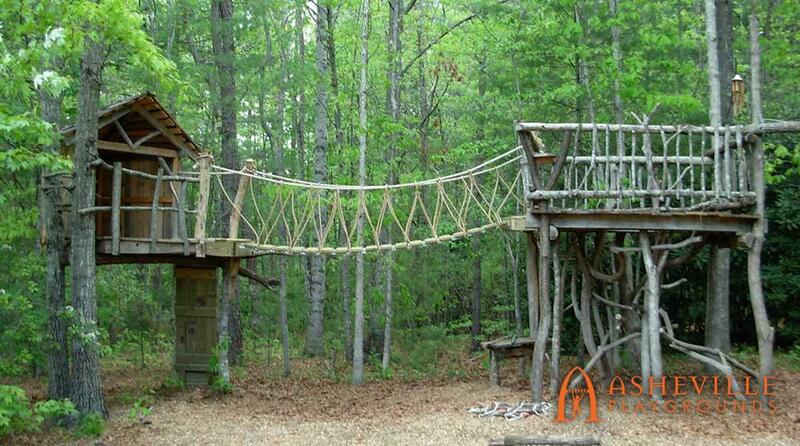 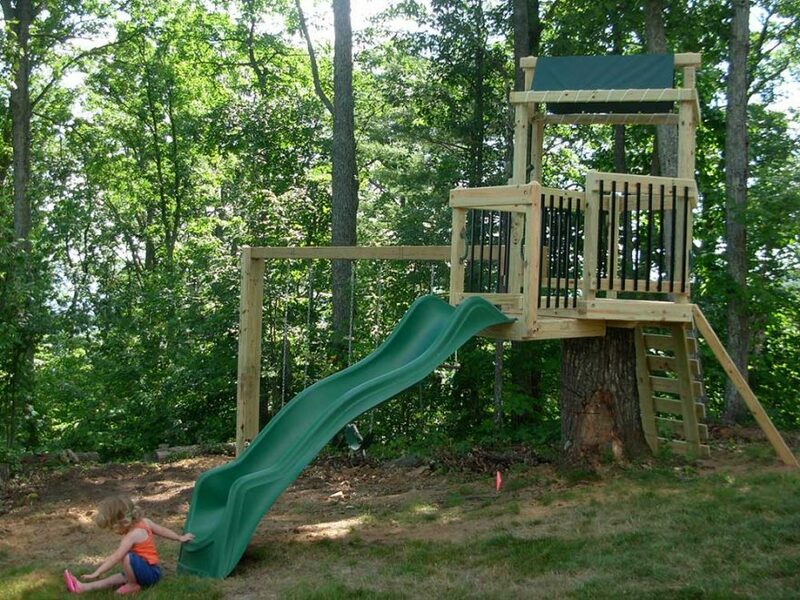 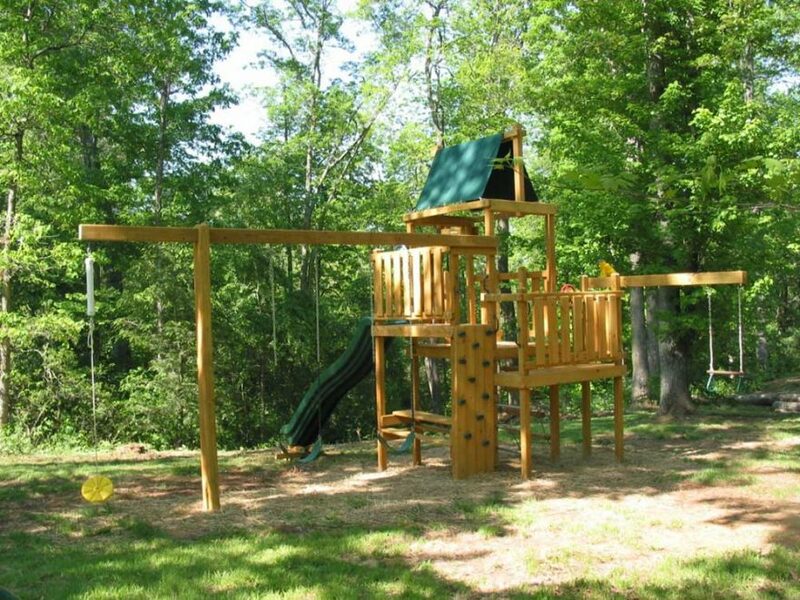 Playgrounds, tree forts, playhouses, and more for your home. 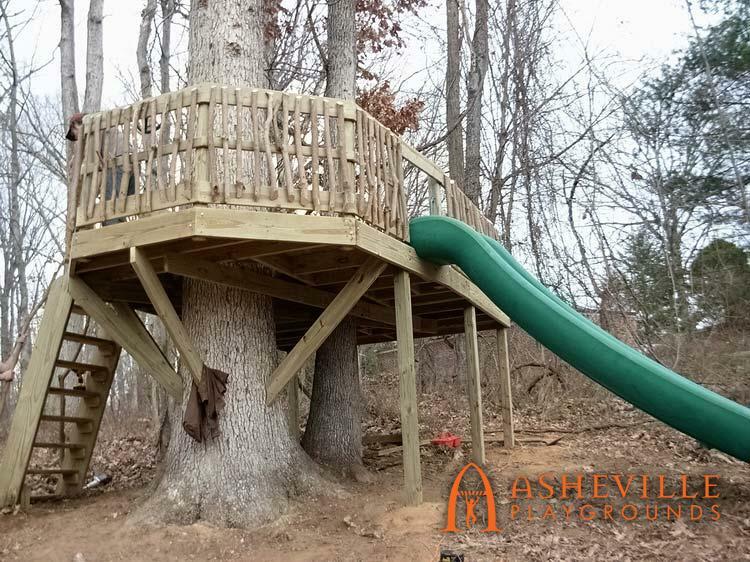 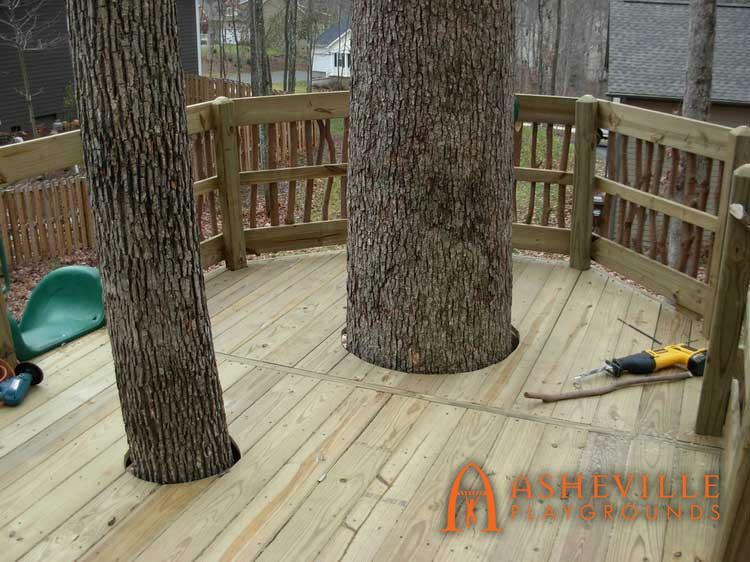 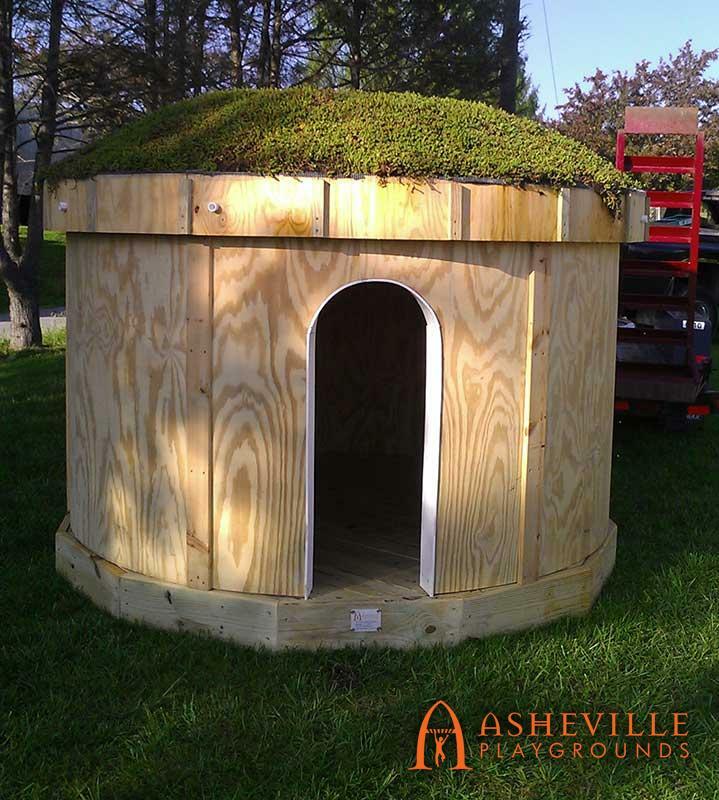 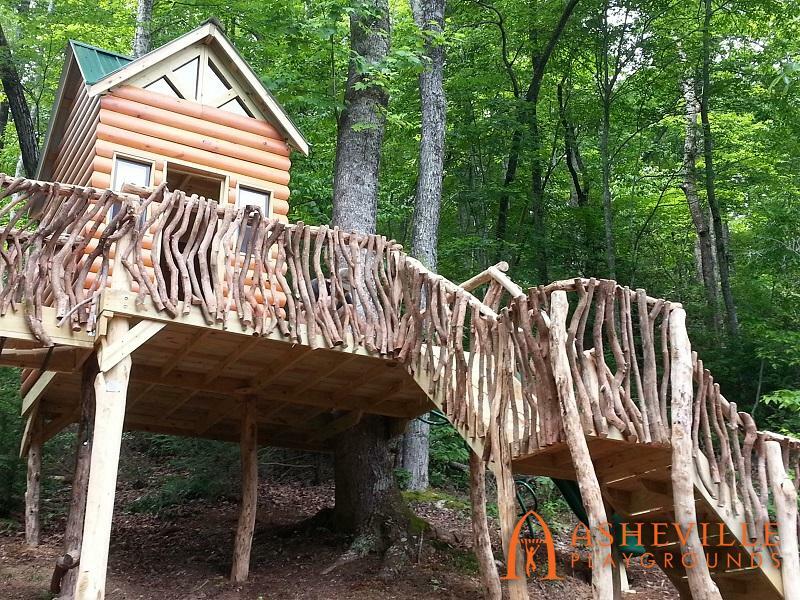 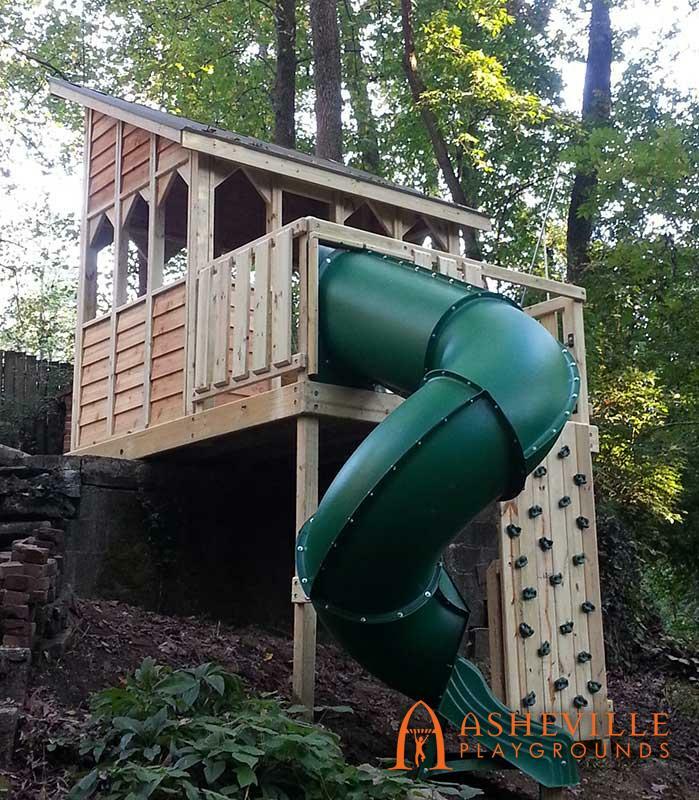 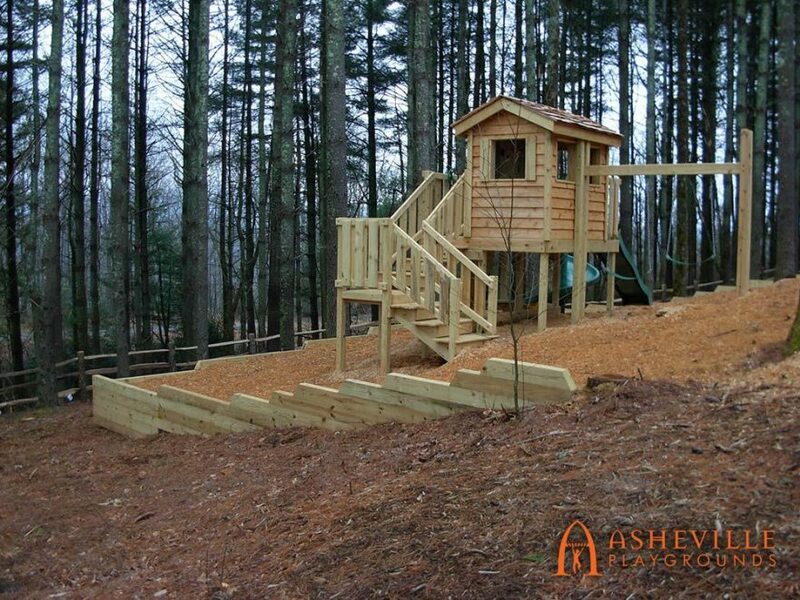 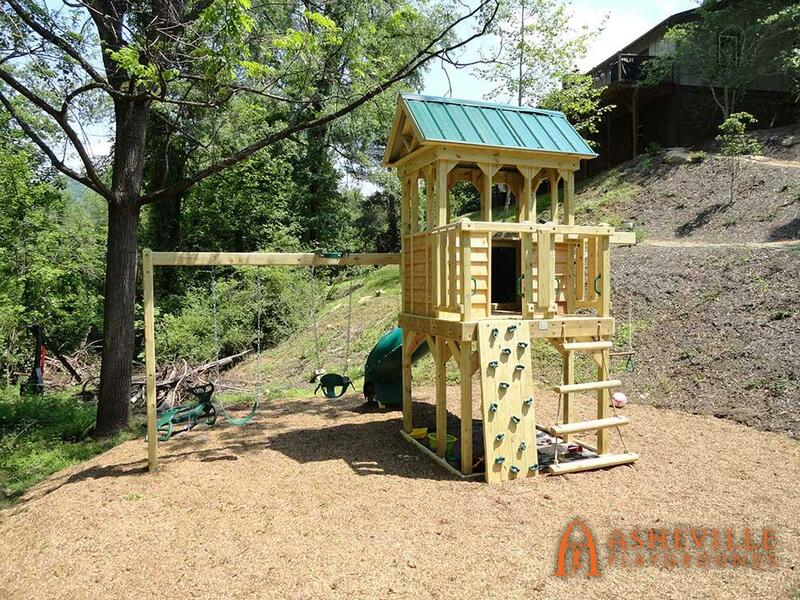 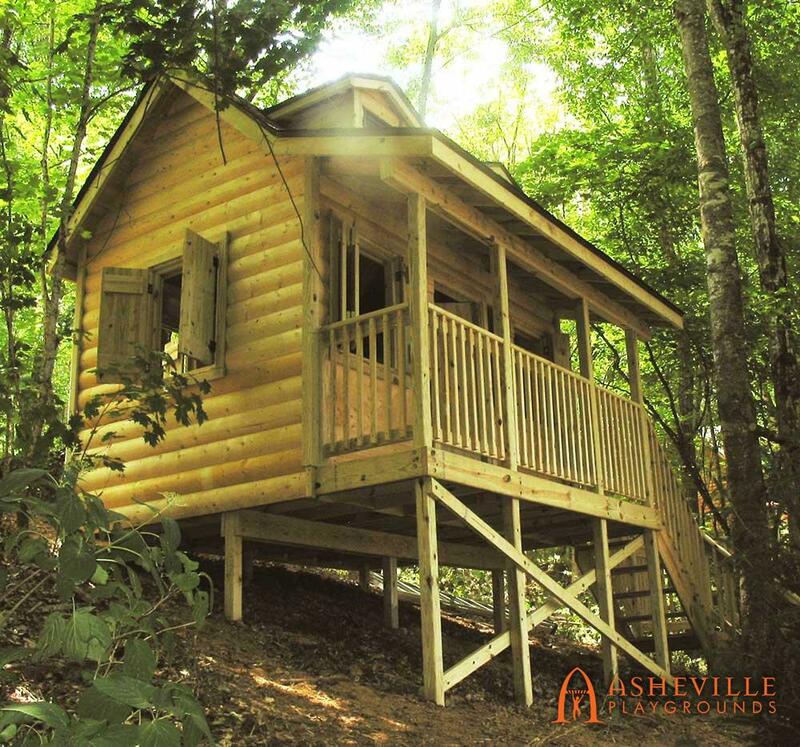 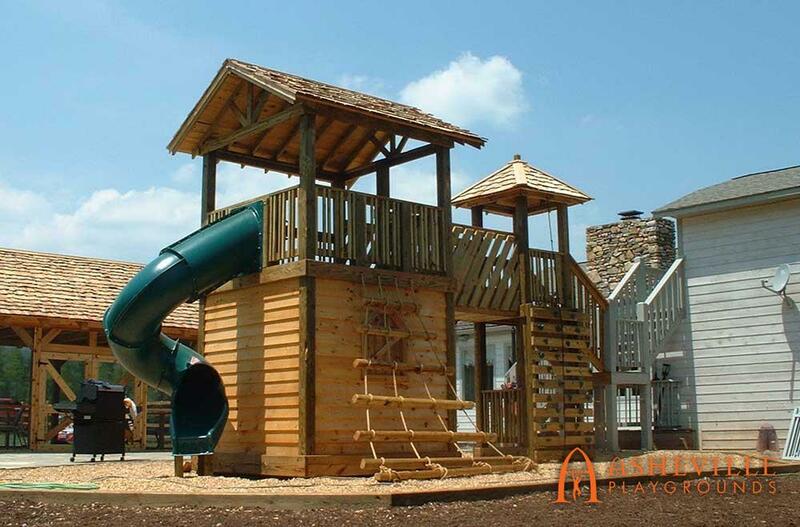 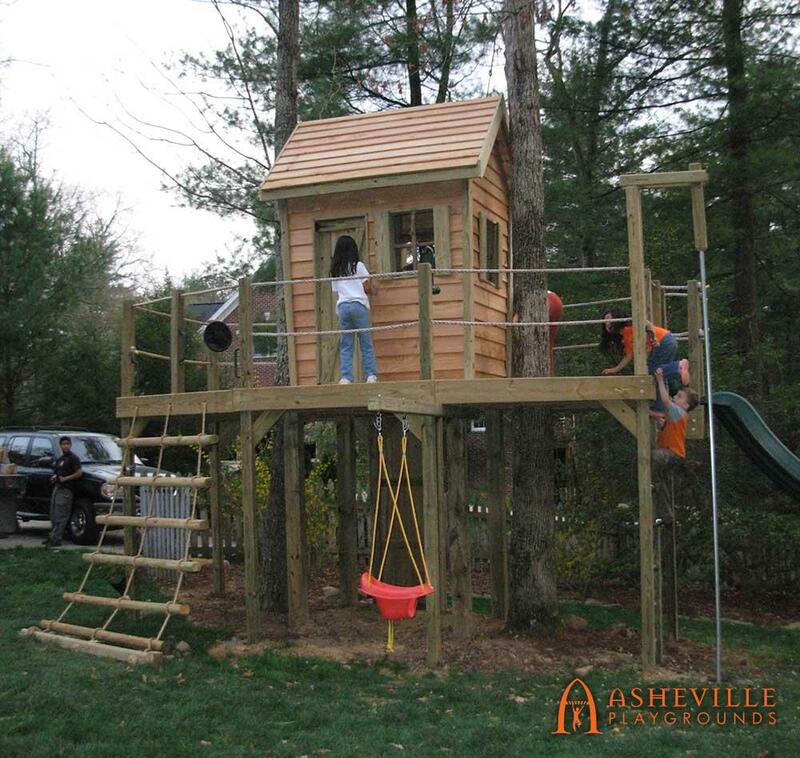 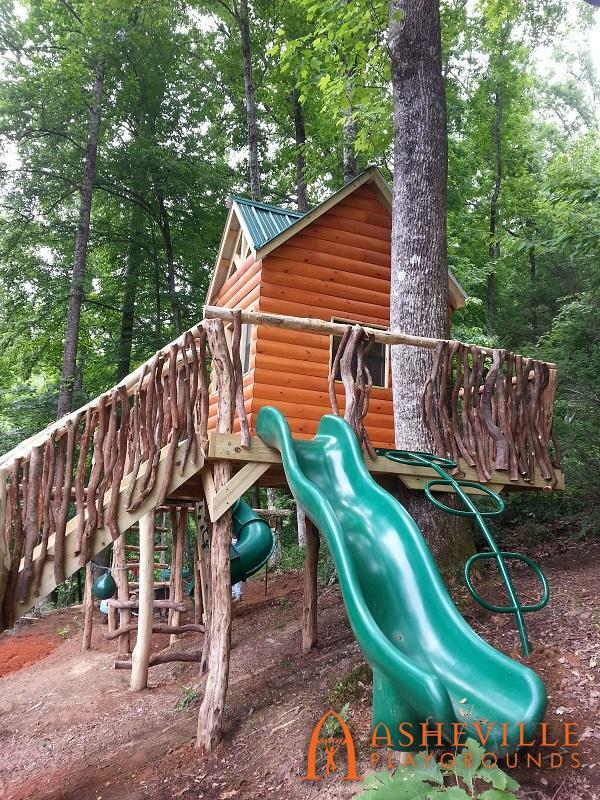 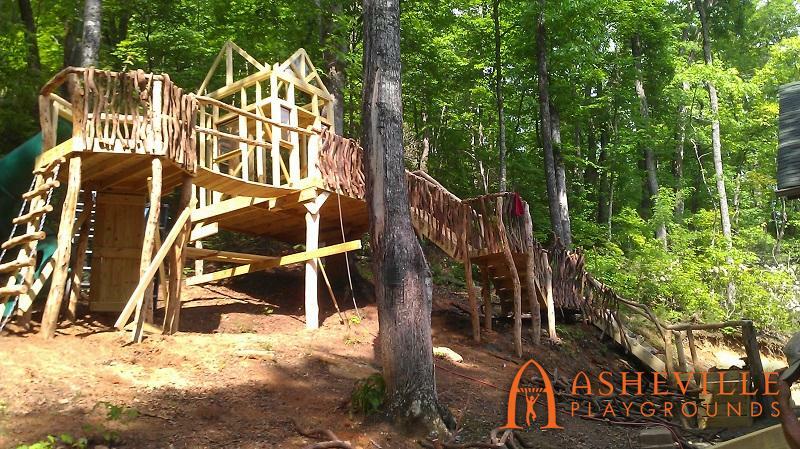 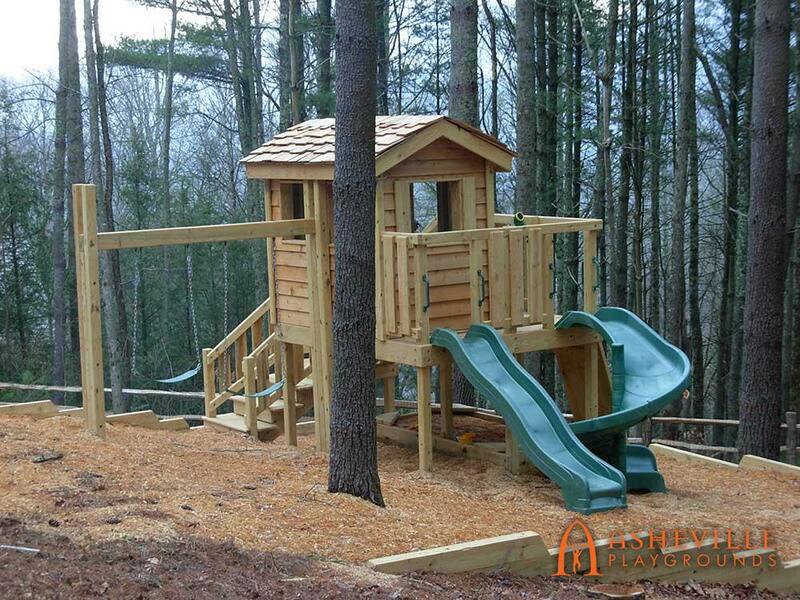 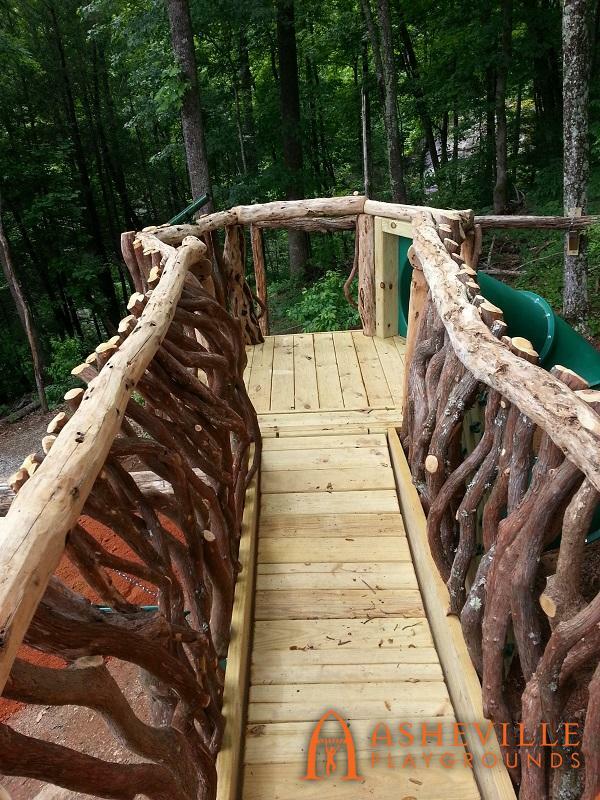 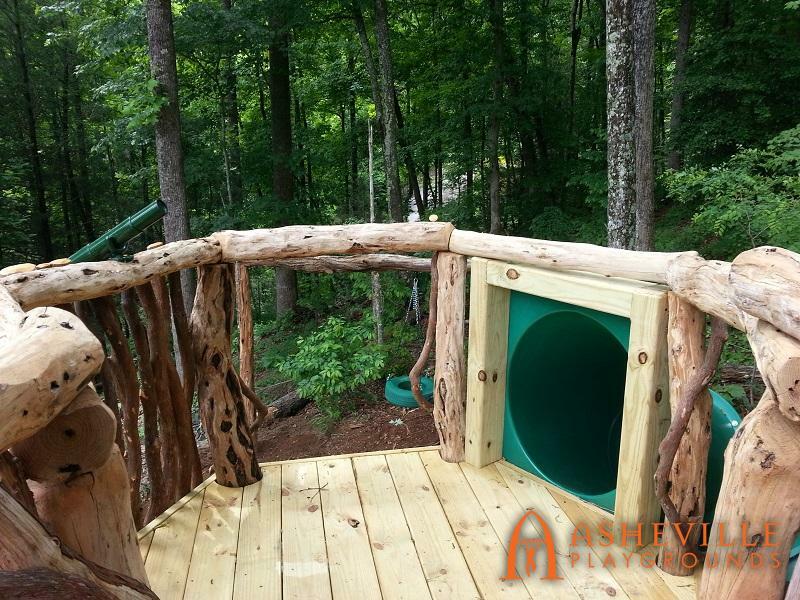 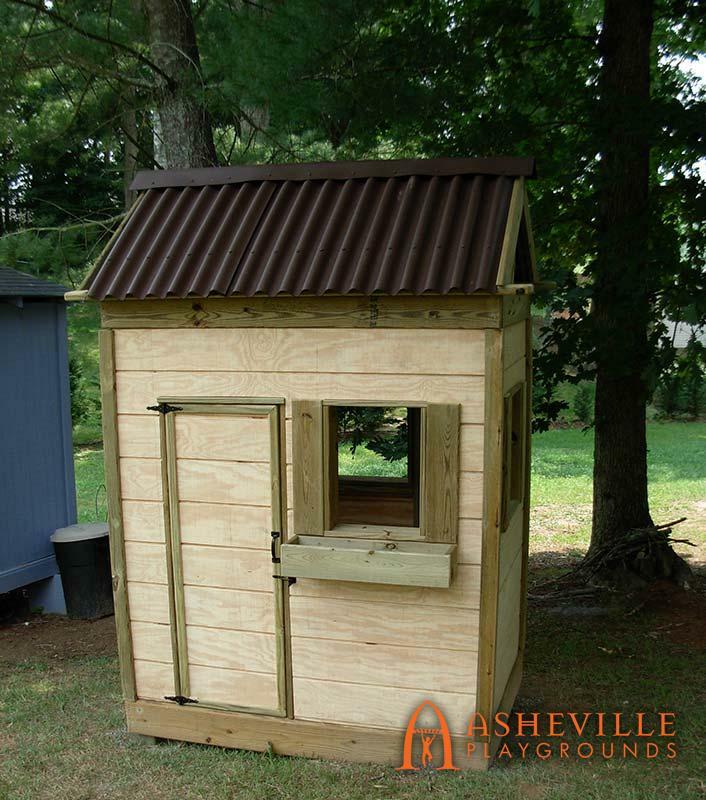 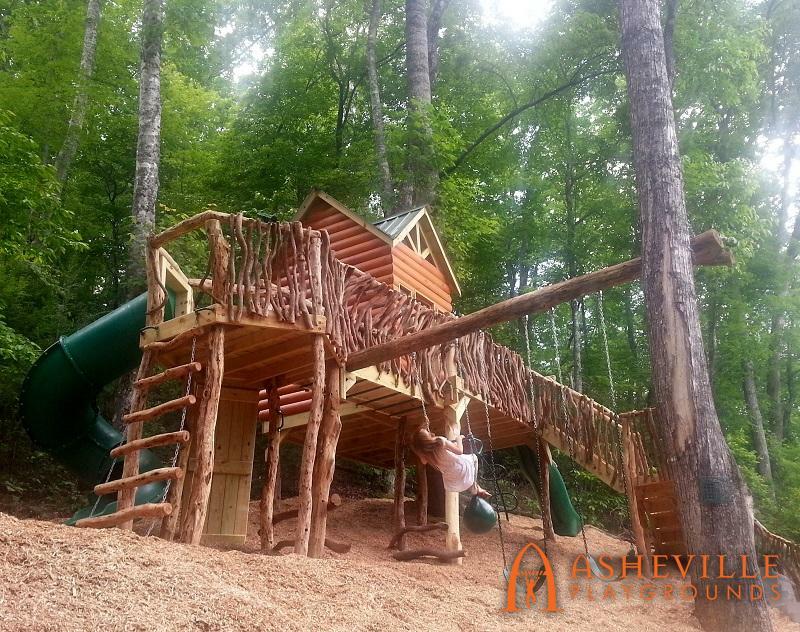 Residential play spaces are a specialty here at Asheville Playgrounds, particularly when we design your playground to complement the look of your home. 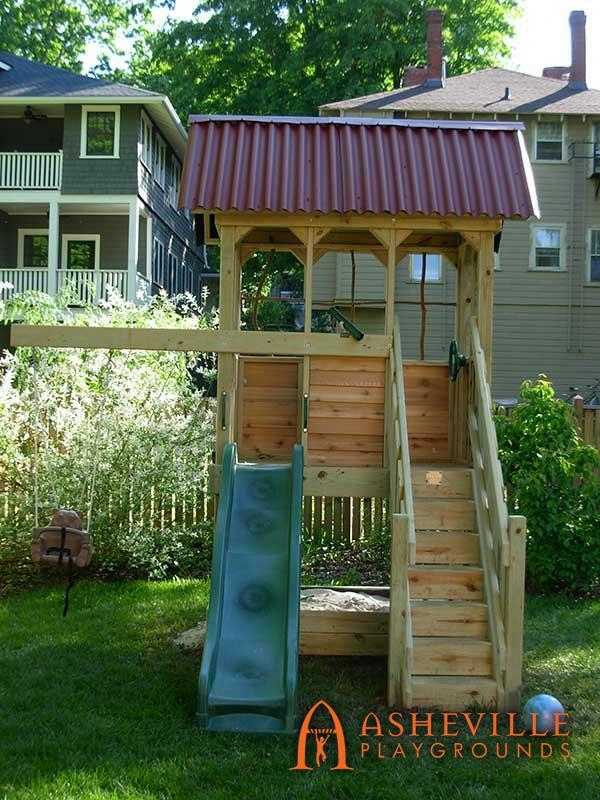 We can use the same colors, stains, roof and architectural details. You can choose from our wide variety of styles and customize it to fit your family’s needs. Examples include extra swings, longer slides, rock walls, tube slides, multiple deck heights and so much more! 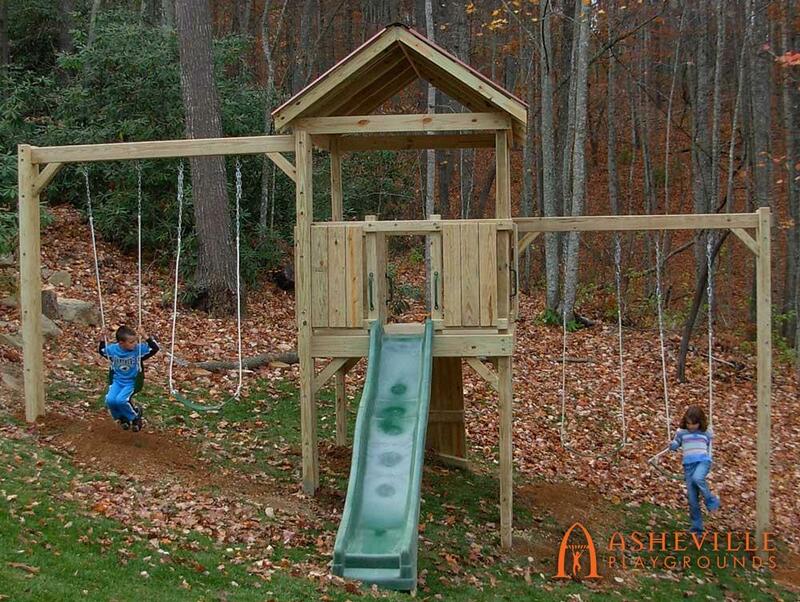 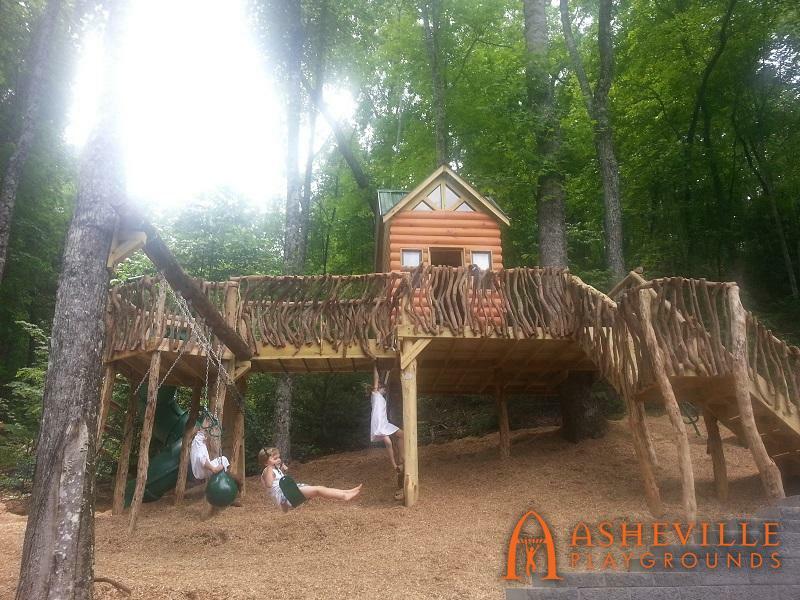 An Asheville Playground will turn your backyard into a wonderland of fun and excitement for all ages to enjoy. 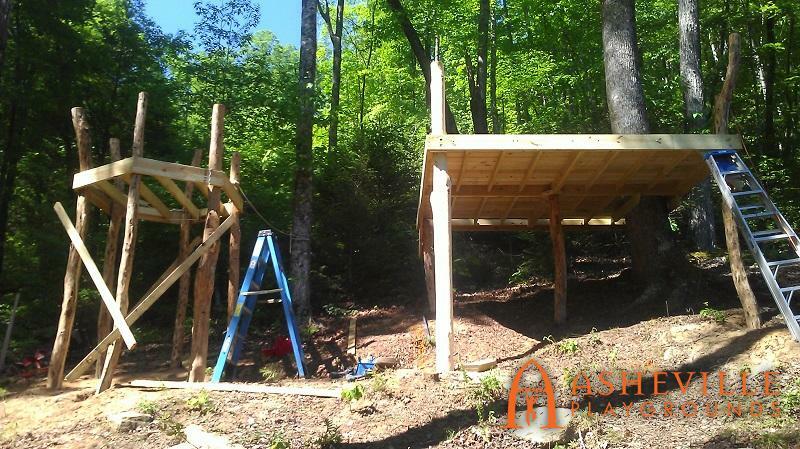 We set our posts in concrete, which allows us to build on uneven grounds and slopes. 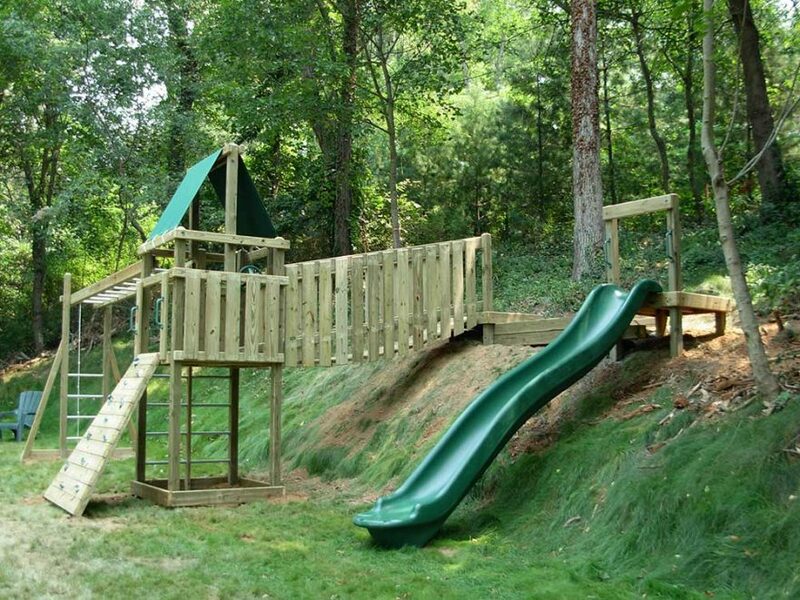 Working with the natural landscape of your yard, we use that uneven ground rather than work against it! 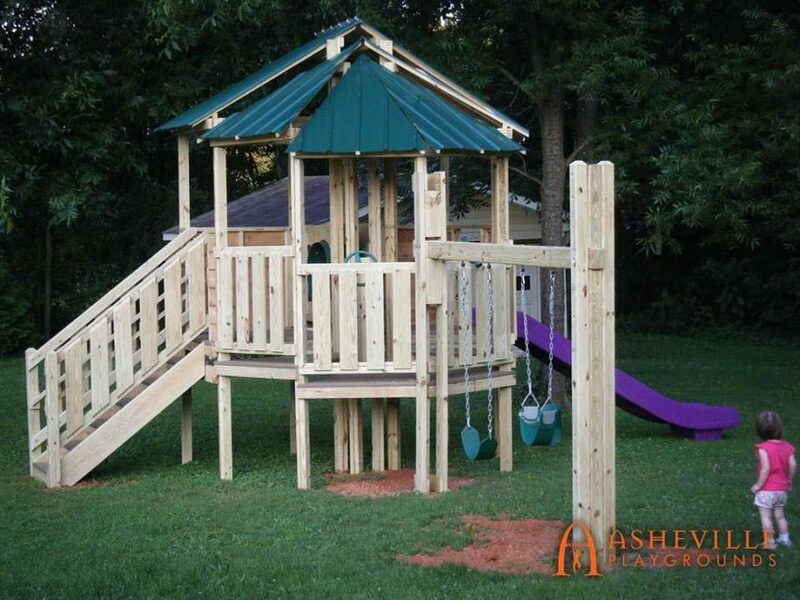 We have been asked in the past to construct playgrounds suitable for those with special needs to the standards of the ADA. 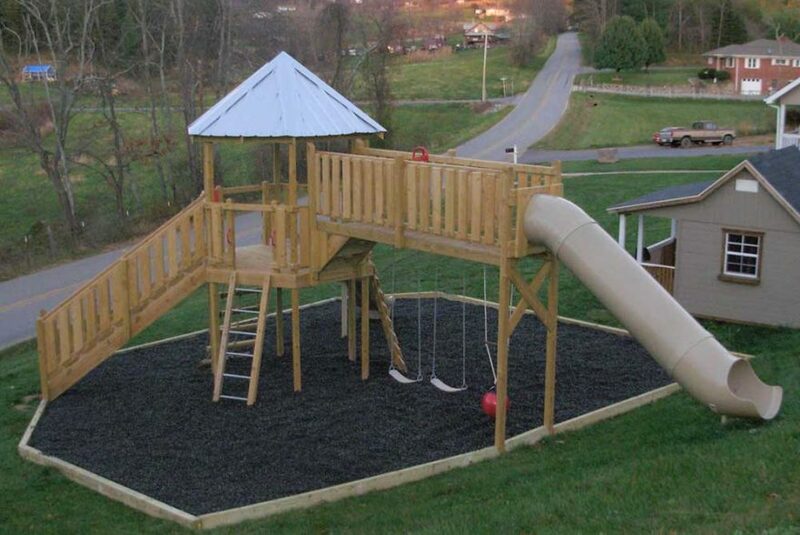 Due to our unique designs and exemplary quality, we have never had an HOA turn down one of our playgrounds. 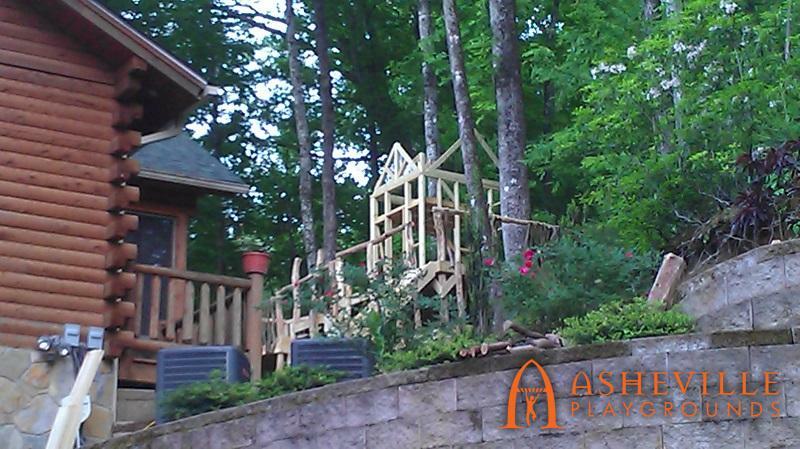 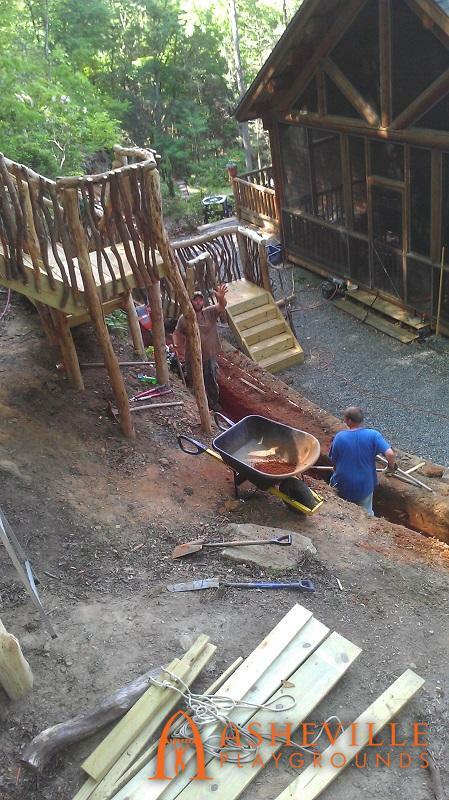 In 2014, the Harms family called us up and wanted to build a playground on the steep hill behind the lake house. 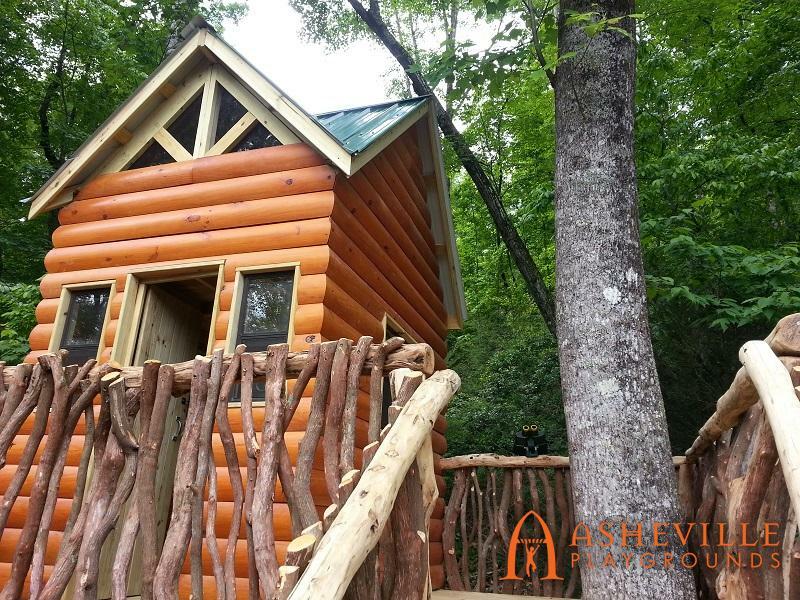 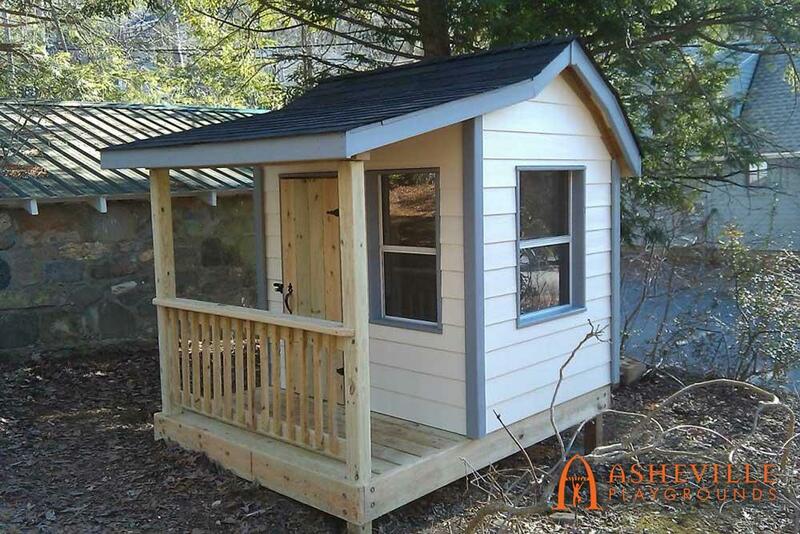 After a site evaluation, it was decided that they wanted a cabin replica of the lake house. 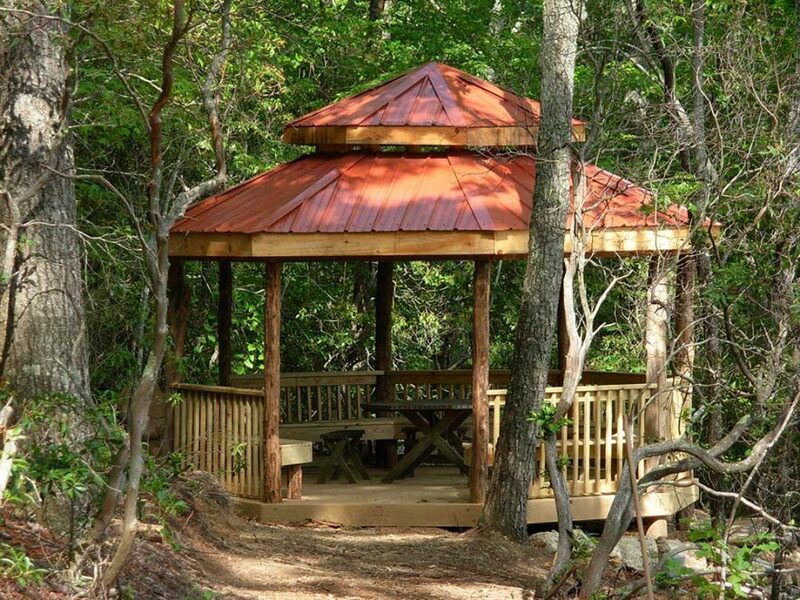 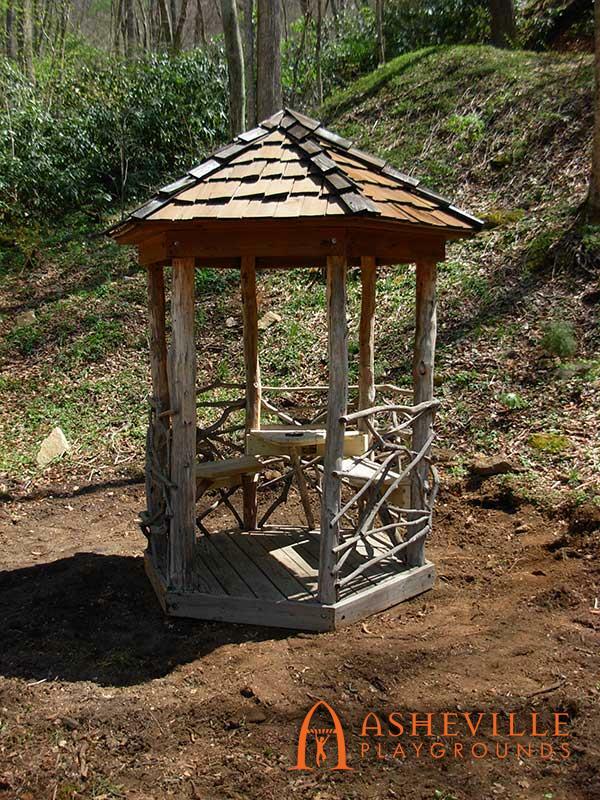 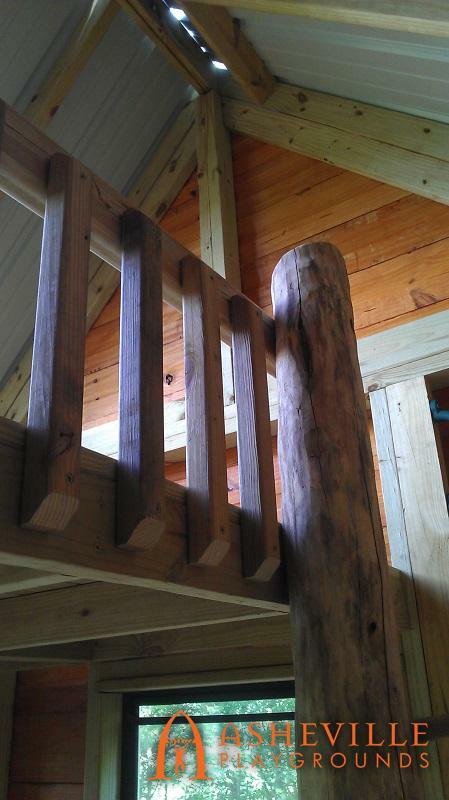 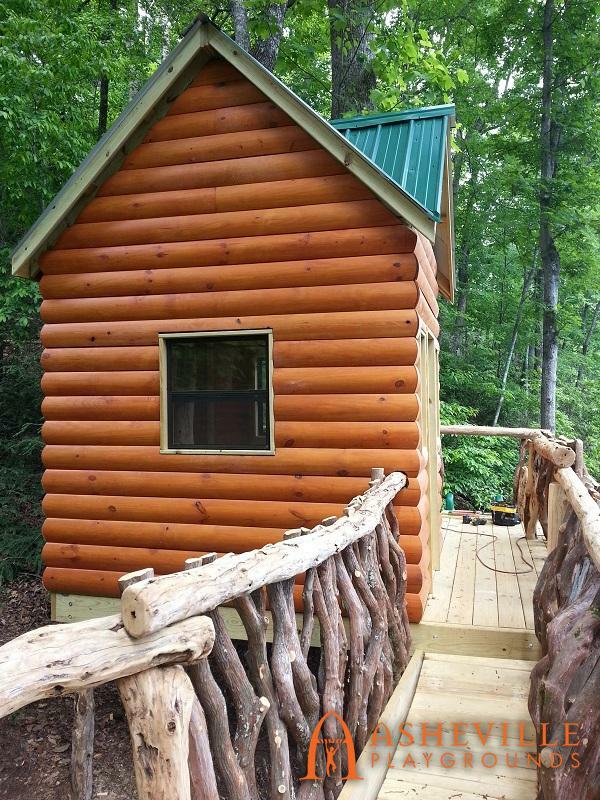 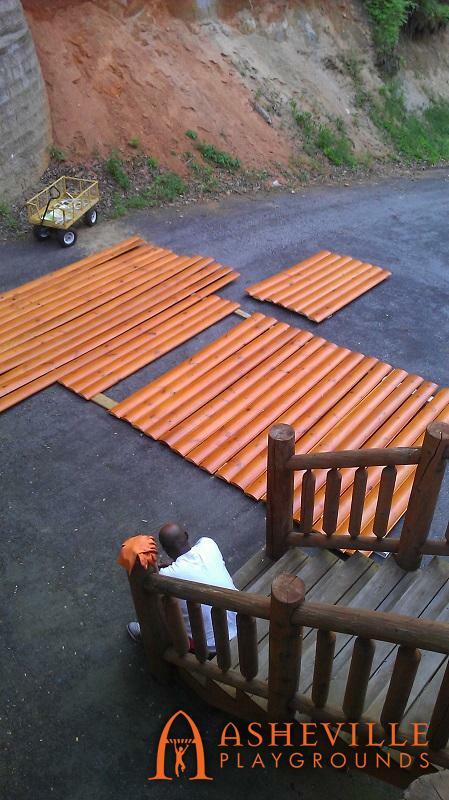 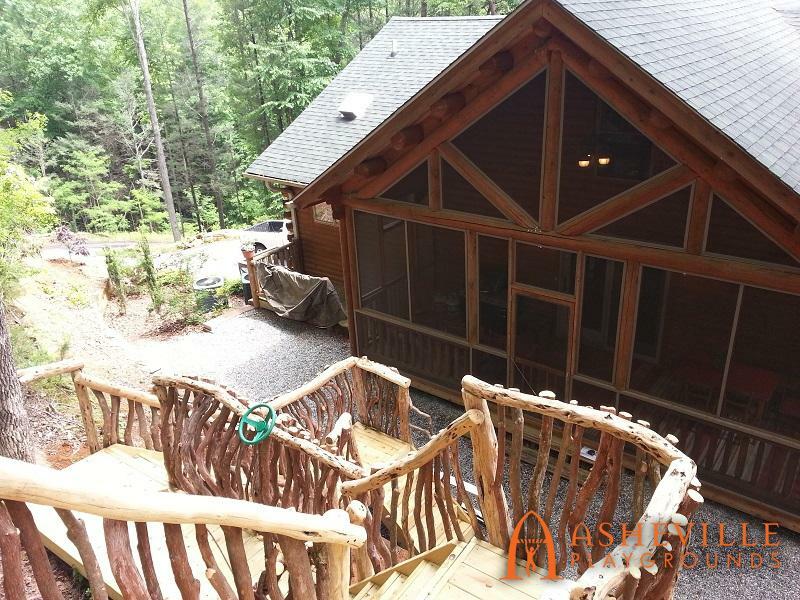 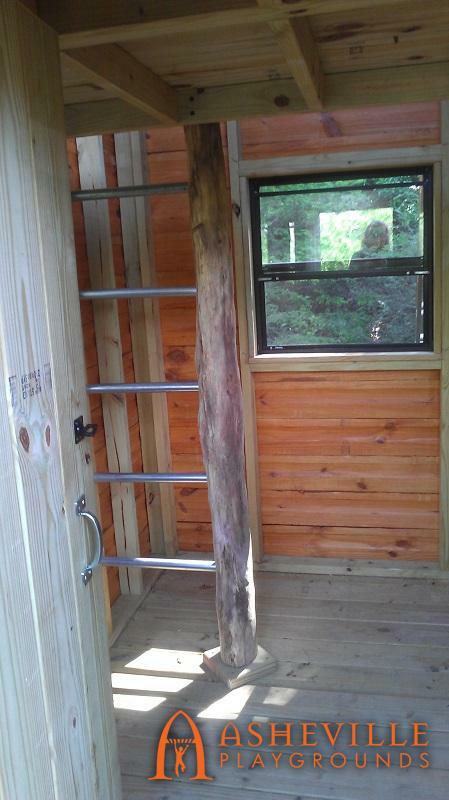 This would include natural features like mountain laurel pickets and locust posts and handrails. 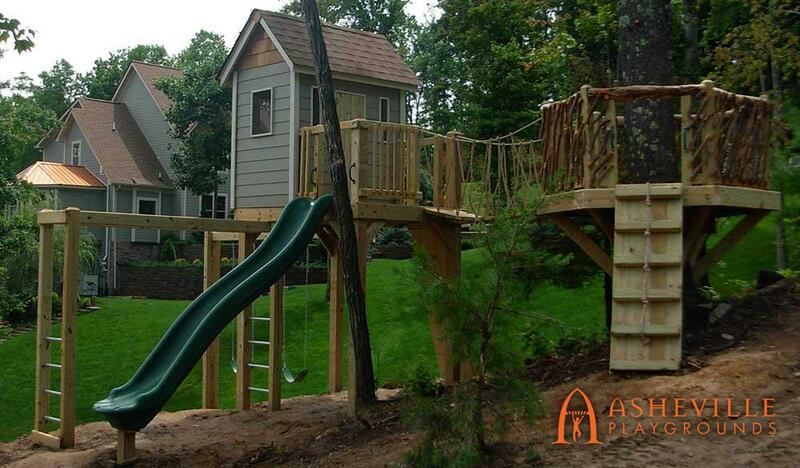 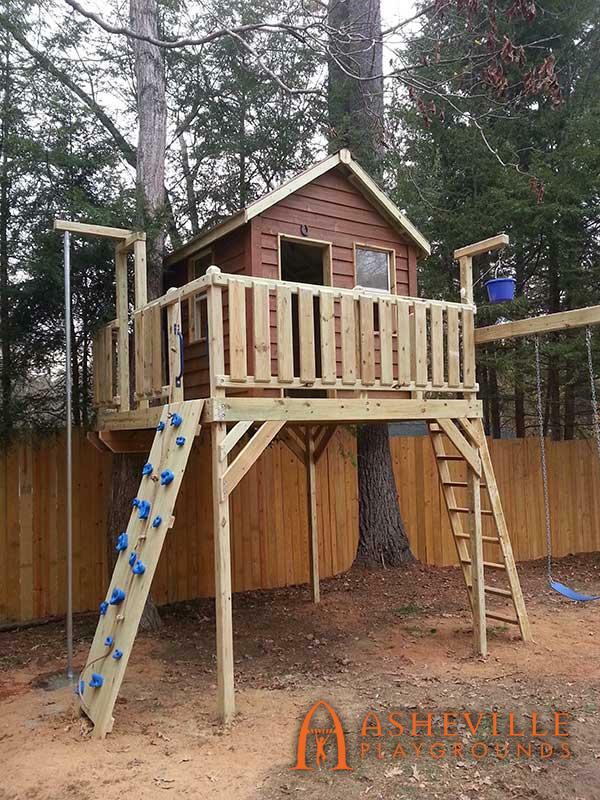 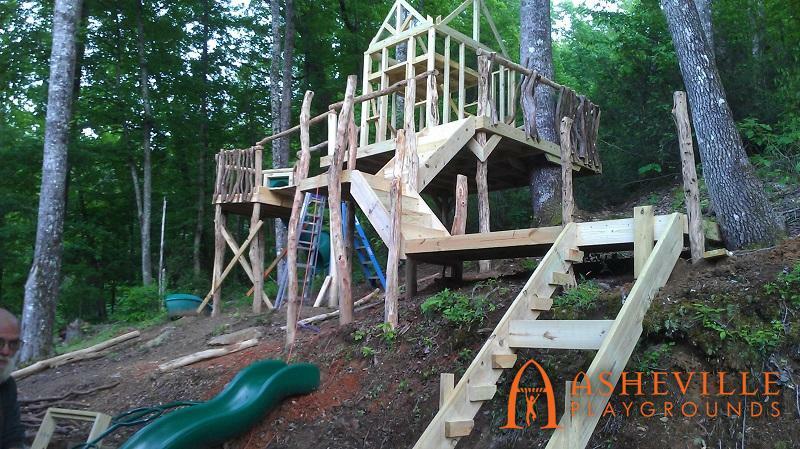 The playground required a two story staircase from the lake house to the playhouse. 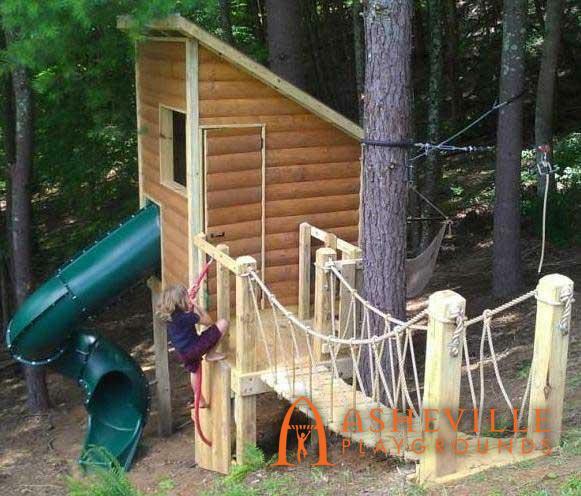 Other features include a 7’ high spiral tube slide, 5’ wave slide, log climber, rock wall, monkey bars underneath the suspension bridge, swings with a trapeze bar/buoy ball, and two strap swings. 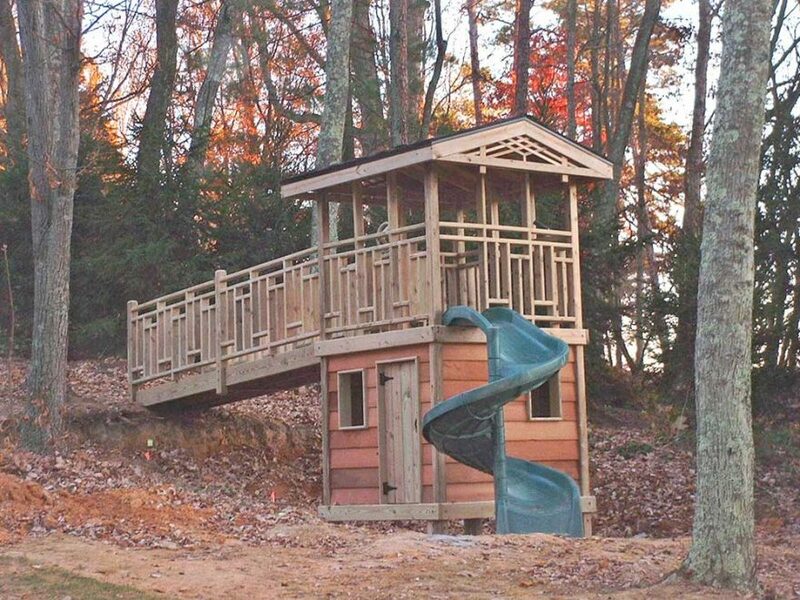 The long staircase goes all the way down to the house. 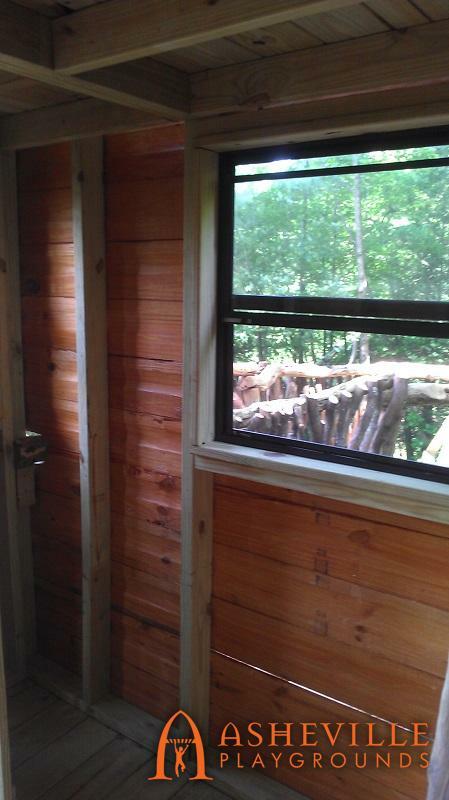 And the play cabin itself features real working windows with screens and a loft! 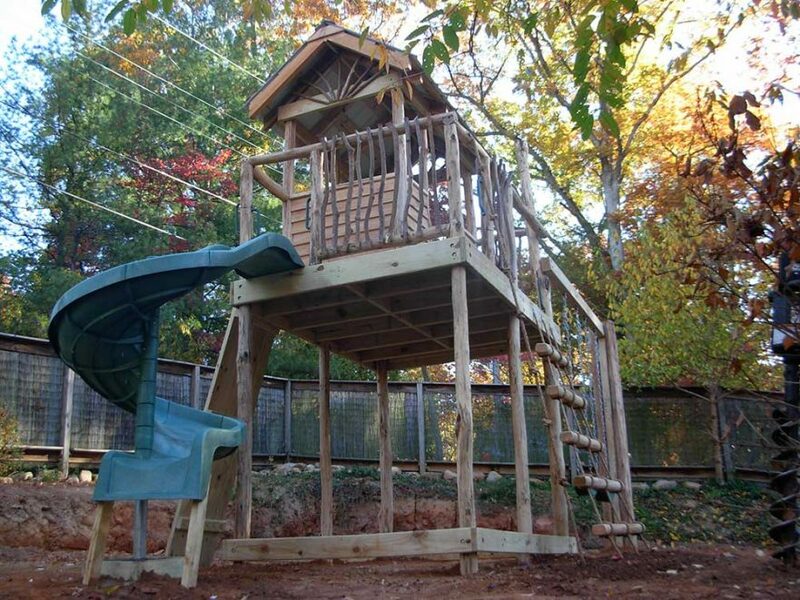 This piece was quite a project, but everyone was very happy once it was completed! 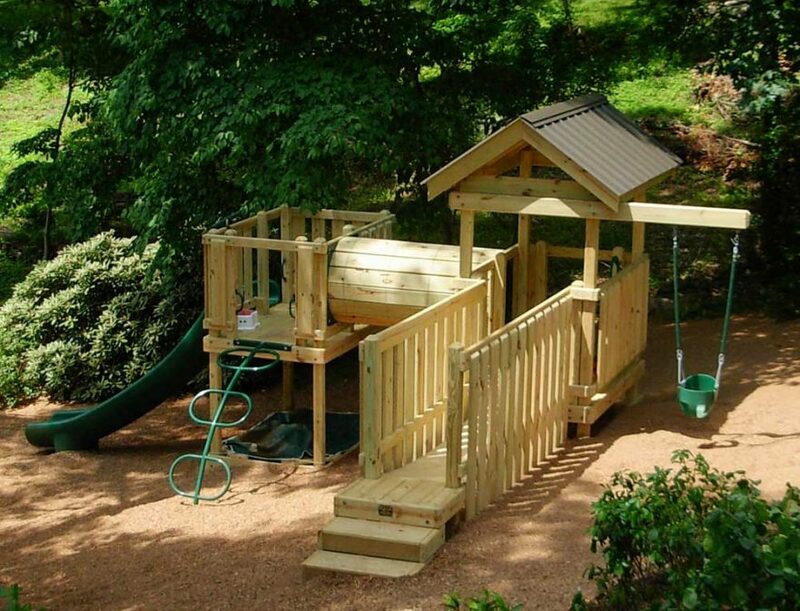 Check out the gallery of this beautiful play space below. 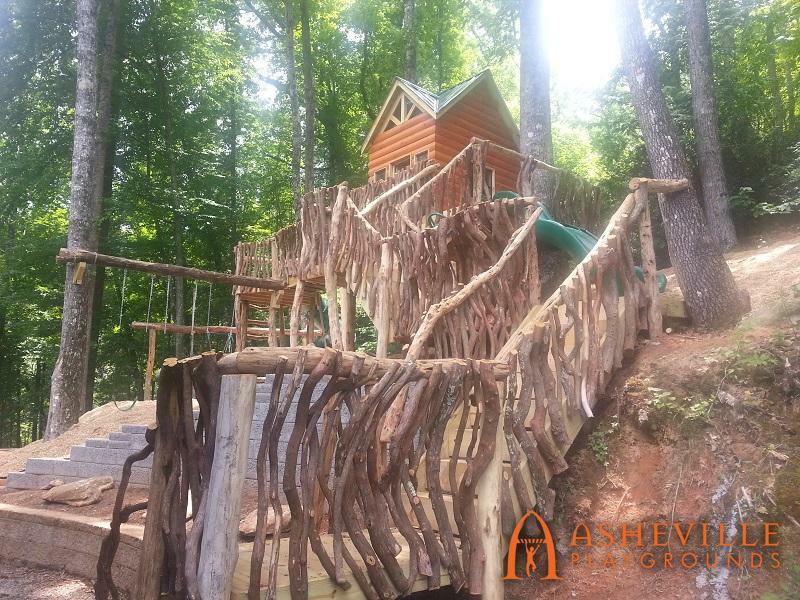 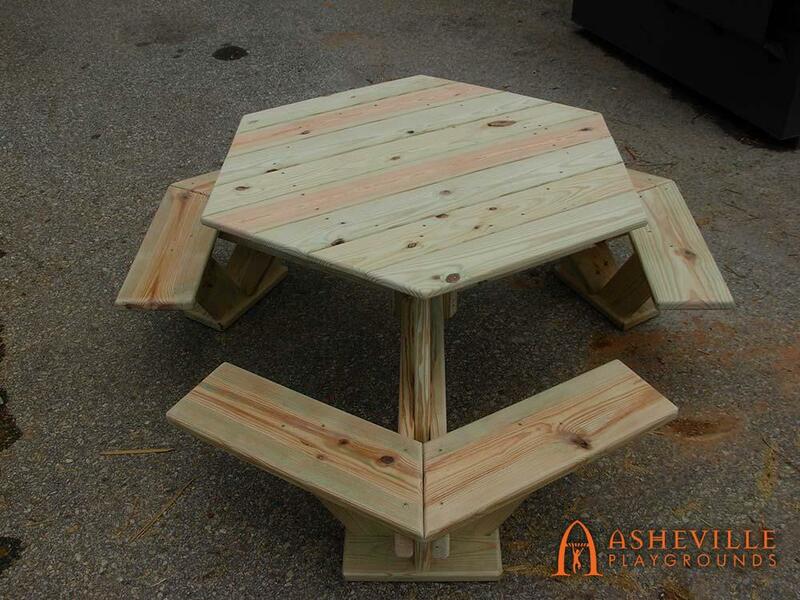 If you’re within an hour from Asheville we will send one of our site designers for a complimentary evaluation. 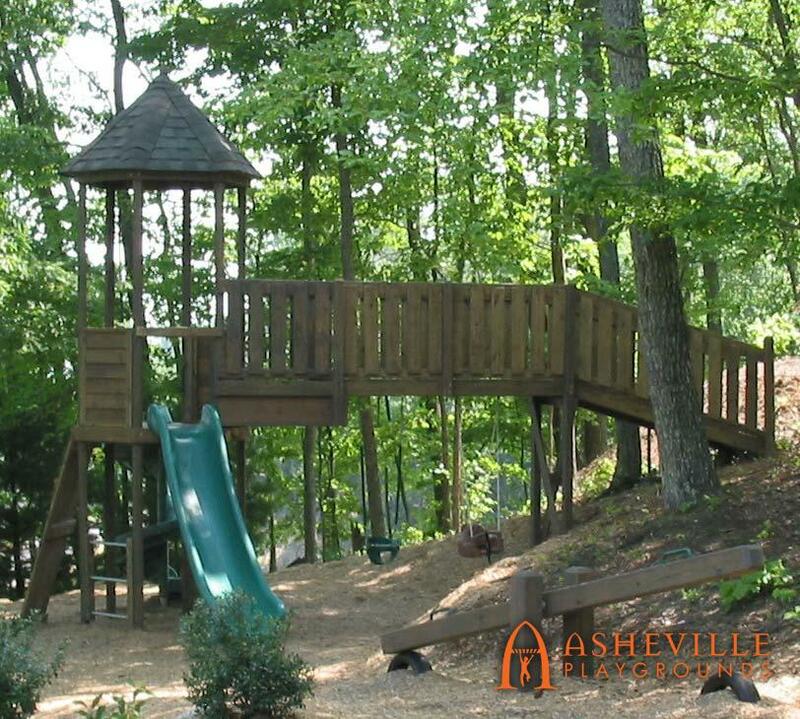 She will bring with her the Asheville Playgrounds “family” photo album to help give you ideas for the perfect playground. 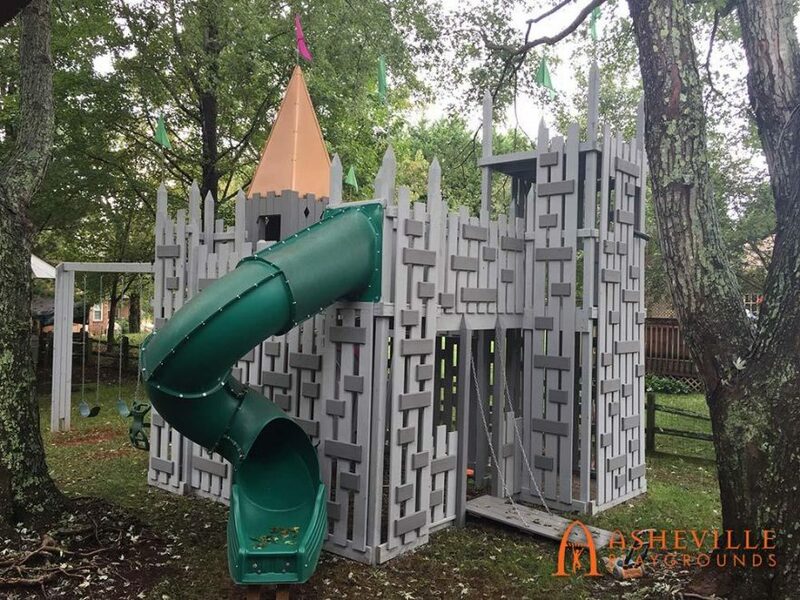 You tell her what your children like to do on other playgrounds and together you will determine the style and features of a play space that is perfect for your family. Fun, long lasting and durable are our goals for backyard playgrounds. 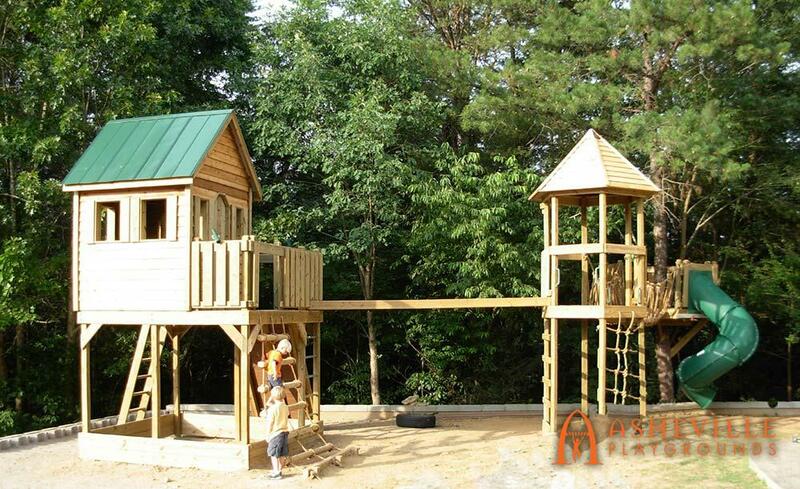 We consider the age of your children and what they can do now and the future. 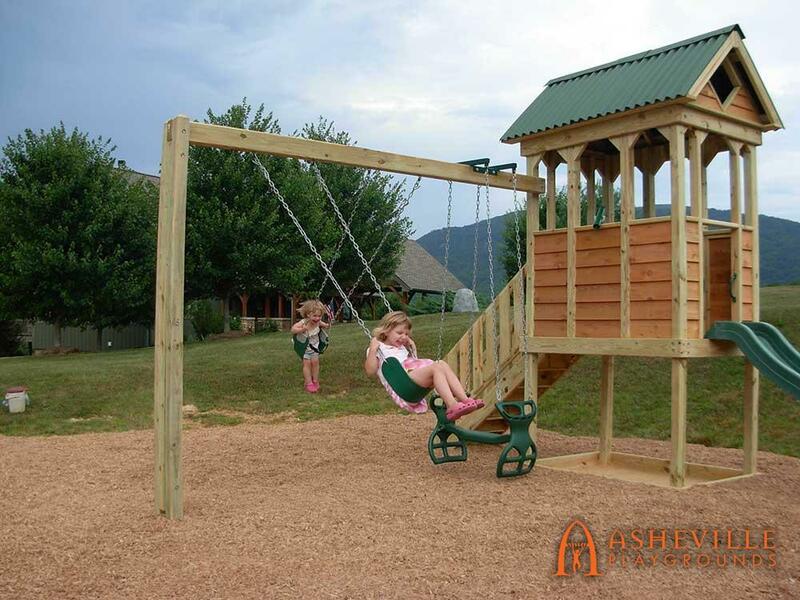 As your kids get bigger, we want them to have even more fun growing into their playground and have a play space to last them into their teens. And of course, we closely follow the highest safety guidelines set forth by the Consumer Product Safety Commission. If you’re not within an hour of Asheville, we’re happy to do the evaluation over phone, email and photos. 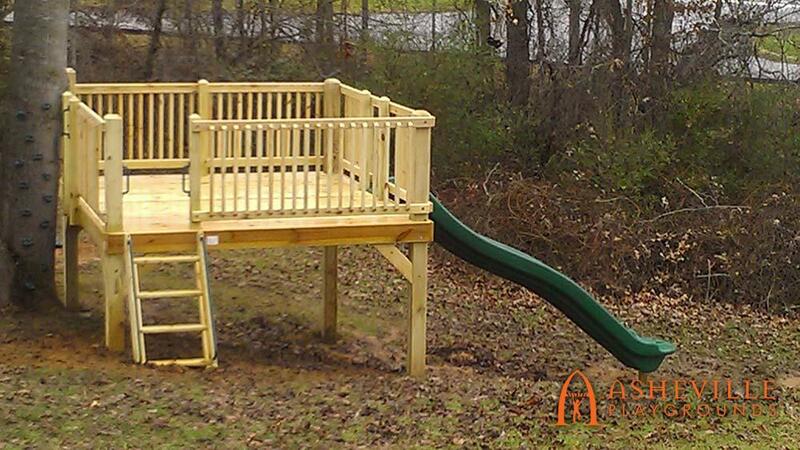 Contact us today to get working on your very own backyard playground!